Mayor de Blasio has made it his goal to reduce pedestrian accident deaths in New York City — with an ultimate aim of zero fatalities. A big part of the effort being made centers around giving more jaywalking tickets. This is not a new idea, as CBS reported that Mayor Menino’s efforts to reduce pedestrian deaths in Boston in 2010 included an effort to obtain permission for the city to write bigger tickets for jaywalking. Jaywalking is unquestionably dangerous, as drivers should not cross against the signal or walk out in front of cars when doing so is not safe. Police cracking down on the behavior could also be effective as a deterrent to prevent jaywalkers from breaking the rules of the road. However, with finite police resources, it is also important that law enforcement continue efforts to stop the most dangerous driving behaviors, including driving distracted or impaired. Stopping pedestrians from walking on the street needs to be just one part of a broader initiative to take road safety seriously. 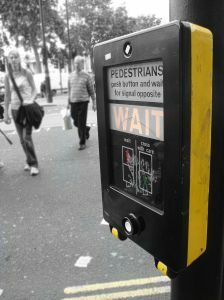 When a pedestrian jaywalks or crosses against the light, this can make it difficult or impossible for the walker to recover compensation from a driver who hits him. In these types of accidents, the pedestrian is usually considered partly or wholly at fault for his own collision. However, even if pedestrians cross against the light, drivers still have an obligation to be safe and stop before a collision whenever possible. A Boston pedestrian accident lawyer can help in these complicated cases. Since Mayor de Blasio has turned law enforcement’s focus towards preventing pedestrian deaths, the NYPD has given out nearly 900 percent more tickets for jaywalking in 2014 compared to 2013. According to Gothamist, police are giving out both real and fake summonses all around Brooklyn. Pedestrians who are not breaking any rules are being given fake summons in order to warn them of the crackdown on pedestrian jaywalking behavior. Many pedestrians and even some police have questioned whether this is the right solution. For example, one officer reportedly told a pedestrian that he ticketed that “he knows it’s just what people do but de Blasio is enforcing it.” Police are also reportedly coaching people to show up in court and indicate that they didn’t know they were breaking the law where they were crossing since the rule is a new one that has not been enforced. With a 2010 study on New York City pedestrian accidents showing that crossing against the signal is the cause of just 20 percent of traffic accidents involving pedestrians, it is also unclear how effective this new enforcement effort will actually be. By contrast, 31 percent of pedestrian accidents involved cars making unsafe turns and 36 percent involved distracted drivers. Still, if pedestrians learn from the tickets that they need to be more careful in crossing, that’s certainly not a bad thing. If you were involved in a Boston car accident, contact Jeffrey S. Glassman for a free and confidential appointment to discuss your rights. Call 1-888-367-2900. Boston Traffic Accidents- Massachusetts’ Top Violent Crime, Boston Car Accident Lawyer Blog, March 15, 2014.